Shadow and Bone made me remember why it is that I love the fantasy genre and every time this happens when I read a really good fantasy novel I wonder why it takes me so long to read another when I'm clearly meant to read and love all these fantabulous books! The mix of fantasy and Russian influences was amazing and made for a very interesting storyline and it made me want to delve into Russian mythology. Does anyone have good recommendations as to what I should be reading in that aspect? Starting Shadow and Bone, I immediately felt immersed in this lush world that Leigh Bardugo has created with her storytelling and I loved every minute of it. I love it when a story grabs me from the get-go and doesn't set me down until I've finished it and not even then! Alina, the main character, was loveable and I felt myself rooting for her, being scared for her and rejoicing at even the smallest of her victories! I absolutely loved the character growth she goes through and the revelation that tumbles her world upside-down (and I'm not talking about the dormant power surfacing here). I felt that when Alina forms a friendship, she's all in. She's loyal and even though she may not always make the right decision, she owns up to her mistakes and I respected that. I also felt that the reason for her powers being revealed now instead of when she was a kid was really good and explained a lot about her life and abilities so far. And gosh, can I just say that I loved Mal? The boy is simply amazing and I'm wondering if in the next two books we'll also learn if there's more to his tracking abilities than just skill. I'm thinking there's something going on there as well. I absolutely adored the idea of the Grisha and the Darkling, though I'm not completely sure as to how it all works exactly, but I'm willing to for now put that aside and hope that all will be revealed later on. The Darkling was both scary and compelling at the same time and I can really understand the pull Alina felt towards him. I had not seen a major plot twist coming and I absolutely loved it! Leigh Bardugo kept me guessing as to what was wrong and right and if anything anyone said was true! OMG! Towards the end I thought Leigh Bardugo was going to pull something that also happened in The Girl of Fire and Thorns and utterly rip my heart to pieces and then stomp on it! I'm so glad Mal was ok, I mean, I just love that boy and I would have been devestated if he'd died! And GAH! The evilness of the Darkling was just mindboggling! The only thing that sort of made me go 'huh?' was that everyone just seemed to heal from what I'd thought would be mortal wounds. You can't just walk everything off and well, getting attacked by a volcra (big bad bird-like thing with huge claws and such, if I'm picturing it right) would leave you a bit incapacitated I'd think. To sum my thoughts up: this was a powerful start to what I expect will be an epic YA fantasy series! 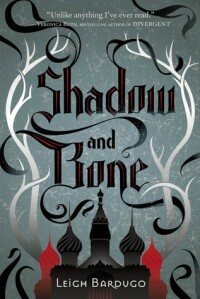 If you like the genre at ALL, you should definitely pick Shadow and Bone up! Leigh Bardugo drew me in with her compelling storytelling and I immediately connected with Alina and just felt everything right along with her! Cannot wait till the sequel Siege and Storm will be released! !